Back on the train from Irkutsk to Ulaan Baator, Mongolia. If Irkutsk is a frontier town, the scenery to the border with Mongolia and through Mongolia is definitely wild west ranch country. It's like passing through 1890s western USA, just with less buffalo to shoot. I see lots of grassy plains, rocky deserts, herds of wild horses, cows and sheep. Loading up at Irkutsk, I find I am sharing a 4 bunk cabin with one other person, a man around my age who speaks no English. Next to us is an incredibly drunk young Mongolian guy, who is bouncing off the walls he is so drunk. The train attendant is not amused with his disruptive behavior, so she locks him in his cabin for the night. I also meet Alexei from Mondolva (a former Russian territory near Romania). He speaks some English, so we spent a few hours talking. On our way to the border crossing at Naushki, Russia, my cabin mate and the drunk Mongolian from the night before enter the cabin and shut and lock the door. From under their shirts, they pull out 3 half-liter cans of beer, and offer one to me. Apparently they have locked the door because they are afraid of getting caught by the train attendant, who already has a dim view of the Mongolian fellow. I pop open the top of the beer. Through a little English that the Mongolian speaks and the little Russian I know, plus a lot of hand signals and drawing of pictures, I find out the following information about the two. The Mongolian is called Soonay (not sure on the spelling) and is studying in Irkutsk. He is studying to be a police officer. The Russian (who I am sharing the cabin with) is called Alex. He operates a gold digging machine in Mongolia, and is from a town in South-west Russia. We arrive at Naushki, where we have to wait for the train to arrive from Mongolia, which will hook up our car and take us to Ulaan Baator. We are allowed off the train in this small town. Cows roam the streets. There isn't much to do, so Russian Alex and Soonay grab more beers. As we are sitting in the sun, drinking and waiting, Alex pulls up his pant leg to reveal a wicked scar on his knee. "Chechnya," he explains, and mimes that he also got shot in the shoulder. He was in the hospital for 13 weeks before he was discharged, and that's when he went to school and learnt geography and became a gold digging machine operator. Russia is such a big country, it's easy to forget as you pass through it that things are pretty unstable down in the Balkans. Just before I arrived in Russia, there was a large battle fought in one of the Balkan states. We wait in the sun, and drink a few more rounds. Finally the train arrives, and we get back on and clear Russian customs. I am unsure how to fill out the form, especially the "Printed Materials or Other Purveyors of Information." I have a few books, does this count? I decide to put no. It's also weird having to put down how much money you have. It feels a little like you are just telling them how much the bribe should be. It's good to be off the train. Irkutsk, Russia has a feeling of a wild west town. Siberia has often seen itself as Russia's answer to the USA's wild west. Siberia is the wild east of Russia. There are lots of little wooden cabins lining big streets. I kept expecting Black Bart to step out and challenge me to a shoot out. I only had a day here, which I spent wandering around. The weather was beautiful for Siberia for this time of year. The sun was shining and the temperature was around 11 degree Celsius. I'd love to spend more time here. Irkutsk is a great gateway to the Lake Baikal region. Lake Baikal holds one fifth of all the fresh water in the world, more than Canada / USA's great lakes combined. Lake Baikal is small, only a 100 miles or so across, but is very deep, up to 2 kilometers in some points. Lake Baikal was formed as two continental plates have pulled apart slowly. Eventually, these plates will pull completely apart and separate Asia by a newly formed ocean. Does this mean that if I had waited a couple million of years, I could have done 3 continents on this trip? Next up, heading South towards Mongolia. Senor Lenin, which way is that? "Aficionados of going nonstop from Moscow ... compare it to being on a sea voyage or having a beach holiday indoors. It's a chance to catch up on sleep and reading, perhaps sharpen your card playing skills with fellow passengers, while the landscape unreels in cinematic slow motion outside." So says my guidebook about the trans-Siberian journey. And I wasn't doing all seven days non-stop. I was only doing 4 days before getting a break in Irkutsk. And it is something like a cruise, assuming a cruise includes being in a cabin with three people you don't know, and not having a shower or hot water to bathe with, and not having a pool to lounge by. It's a pretty low budget cruise. It does have it's benefits, though. While not all you can eat, food is incredibly cheap. Firstly, because I was doing nothing, I was eating little - just a couple small meals a day. And most of those I bought from vendors along the way on the platforms. Usually a couple of dollars and I would have a small meal of meat baked in pastry and a bottle of water, coke or beer. Of course, given that I can't speak any Russian, it was always a bit of a mystery what was inside the pastry until I bit into it. Sometimes meat and onion, sometimes cheese, sometimes hotdogs. But it was never an unpleasant surprise. My cabin was quite small, and had four bunks in it. For the first day, all four bunks were full. I was joined by a sullen, 20 something who spoke to no-one and a couple of older ladies who chattered to each other for a bit. The strange thing was, though, that they all went to sleep around 6 in the evening. So I went to explore. There was no one else on the train that I could find that spoke any English, so no lively conversations to be had. There were a couple of army-recruits playing cards and drinking a few cabins down from mine, and I thought briefly of joining them, but then decided playing cards with drunken soldiers (who probably have weapons) my not be a winning proposition for me (even if I end up winning at cards). There was a nice dining car attached directly to our car. It was quite fancy, but kept incredibly dark. I only ate there once, but it was an excellent meal and only 12 dollars for a chicken with potatoes and beer. But really, I was never that hungry again, and the platform purchased pastries were much cheaper. Sometime in the middle of the night, my fellow cabin mates the sullen 20-something and one of the ladies left, leaving the four person cabin just to myself and the other woman. This is a situation that would persist until late on the 4th day, when we had another man join us and were 3 in the cabin again for a short while, until the woman left. 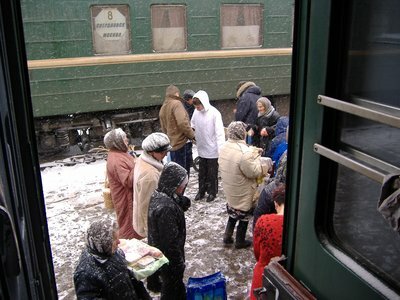 The man joined us at Krasnoyarsk, getting on the train with nothing but a brief case and a cell phone, which we was chattering into. After finishing his call, be threw his briefcase in storage area, took off his pants and collared shirt, and spend the night reading a Tom Clancy-like Russian thriller in his shorts and underwear. Very casually, life on this train. I did a lot of reading and staring out of the window. The scenery was nice, but repetitive at times. to start, leaving Moscow and climbing into the Urals, there was birch and pine forests punctuated with drab industrial towns. As we climbed into the Urals (which are really just big hills at the point where the trans-Siberian crosses them), we had more forest, less drab industry and more snow. On the third day we descended from the Urals and crossed into Asia and Serbia proper. Strangely, the snow disappeared, replaced by lots of sun. The landscape alternated between fields, agriculture, birch and pine forests and boggy swamps. There was little to see at nights looking out, except a blackness. If you looked up, however, there was a wide array of stars on display. I was a bit shocked to look out one of the north-facing windows and see the big dipper framed perfectly. I had expected, like Africa or South America, that I wouldn't see the same stars as at home. Of course, logically thinking about it, we both see the same Northern hemisphere stars. But I must admit that I feel if I am this far from home, everything should be different. A couple times I got really antsy and thought I couldn't take much more on the train. At one point (around hour 52 of straight train travel), I wrote in my journal, "I am feeling restless and overheated. I need a good jump in a cool pool. I am sick of reading and staring out the window. This all feels so disconnected." The 4th (and final day) aboard the train I was pretty antsy as well, but luckily had getting off the train (at least for 9 hours) to look forward to in Irkutsk, and thus it muted my jumpiness a little bit. But I was running out of things to do, finally spending time translating things from our alphabet into the Cyrillic the Russians use. Finally, some 90 hours later, we passed Zima, the last major stop before Irkutsk and my day off the train. And now the longest part of my journey is over, and the stranger parts begin. A day wandering around a Siberian town, the sights of Lake Baikal, the Gobi desert and the Great Wall ahead of me. To track your progress along the trans-Siberian route, markers have been put up at every kilometer telling you the distance you have travelled since Moscow. At kilometer 1777, you come out of the Ural mountains and enter into Asia. There is an Obelisk set up to see at this site, if you are quick eyed and it is daylight out. I was passing by at night. I have a notebook that I keep with me on my travels to make notes and jot down things to remember. Often it is point form, and not very interesting. Things like "bought gooey meat filled pastry for lunch from guy who looks like lead singer of Radiohead" or "riding the train is a quiet existence." Occasionally, though, I feel inspired (or bored) and write something out in long form that is coherent. The following three paragraphs I wrote with a glass of wine in hand as we approached kilometer 1777 and my first time in Asia. I am not sure if I will know when it happens, as it is too dark to see the kilometer markers, and I don't know if they light the Obelisk up at nights. I feel strangely muted. This doesn't have the immediacy of landing some place in a plane, when I get a nervous and excited energy. There will be no ceremony except for my silently raising a tin cup of Moldova's finest Merlot (straight from the cardboard). And there will be little change to my onboard life - more relaxing, reading, sleeping and eating. Asia (at least to start) will be no different than Europe. I wonder what the Russians make of their bi-continental country? Do the people in Yekaterinburg (just across the continental boundary in Asia) feel Asian or European? Do they even have a sense of continental identity the way I feel both Canadian and North American? 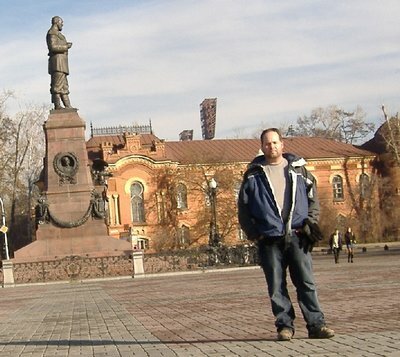 I never saw the marker, so I wasn't sure I was in Asia until we reached Yakaterinburg. And I don't have the language skills to ask my fellow Russian travellers what they feel about being "Asian." And so I bolted down the last of my Merlot, put on my shoes and got ready to jump out onto the platform at Yekaterinburg, and put my feet down in Asia for the first time ever.